“Mr. 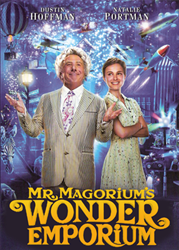 Magorium’s Wonder Emporium” is a tale about a change in the management of the strangest, most fantastic, most wonderful toy store in the world. The film stars Natalie Portman, Dustin Hoffman and Jason Bateman. I was Barxseven‘s CG Supervisor for this project, which included being on-set in Toronto, to take high dynamic range images of the set lighting. Back in Montreal, our team was challenged with bringing magic to the toy store by having inanimate objects come to life, demonstrate playful personalities, and seem to move on their own. Lighting integration was key, as the computer-generated characters needed to integrate seamlessly and photorealistically with the film’s live-action footage. Some of the work we did on this film included creating a magical room of enchanted balls, bringing life to a 6-foot wooden dinosaur who is as playful as a puppy, and embuing personality and photo-real believability into the CG-double of an enchanted, magical, wooden cube. I also rigged the tentacles of a pink squid that magically escapes from the pages of a children’s book about the sea. Because Barxseven is a smaller company, I was a very hands-on supervisor. I did the master lighting, look dev, character rigging, most of the modeling and texturing, and helped develop the in-house render-layers script we developed for this project at the time. We had to be creative with the allocation of render-resources, as these were especially limited. This was the directorial debut of rising Hollywood star, Zach Helm (writer, “Stranger Than Fiction”). Posted on Sunday, December 4th, 2011 at 9:01 pm. Filed under: Uncategorized	RSS 2.0 feed.